Thursday’s volleyball showdown in Carbondale between the host Roaring Fork Rams and the visiting Grand Valley Cardinals had tons at stake in terms of playoff positioning, but only one team came away having set themselves up well in the league standings as the Cardinals pulled off a three-set sweep of the Rams by scores of 27-25, 25-21 and 25-13. Despite the sweep at the hands of the Cardinals, the Rams are by no means eliminated from the playoff picture, but they’ll certainly have their work cut out for them with just four regular season games and the league tournament left on the schedule. 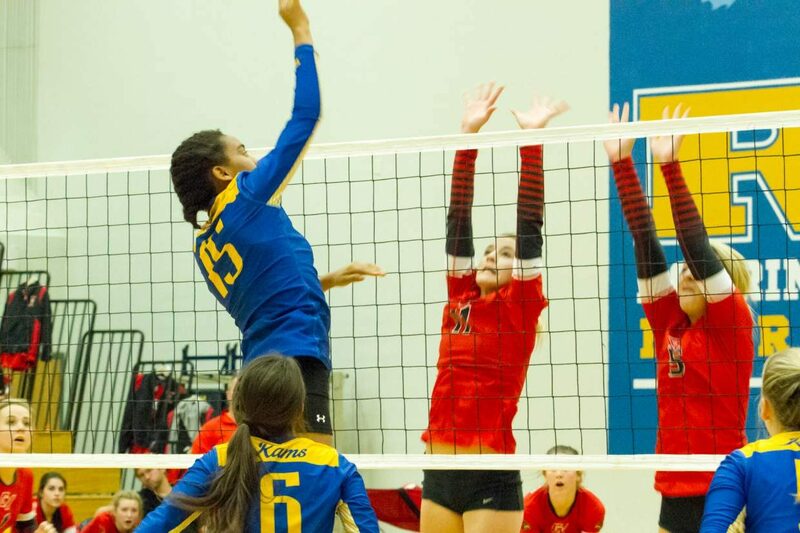 Although Roaring Fork lost in straight sets, the Rams put up a serious fight against an experienced, deep Grand Valley team as Roaring Fork held late leads in the first two sets before ultimately falling late. In the first set, Roaring Fork raced out to a 9-5 lead thanks to kills from seniors Ashley Hall and Cindy Salinas before Grand Valley junior Lohgan McClung answered with a kill of her own to make it 9-6 Rams. Roaring Fork would then extend its lead to 13-7 as Salinas came up with a big block at the net on Grand Valley’s Tara Ruggles to really jump-start the Rams at home. Kills from Rams senior outside hitter Lily Ramos extended the Roaring Fork lead to 16-10 before the Cardinals found their footing and mounted a comeback as senior Bailey Rowe came up with a big kill and junior Layne Teter added a kill and a block at the net to cut the lead to 17-14 Roaring Fork. Moments later a kill by Grand Valley senior Kylyn Rigsby and a kill by Ruggles made it 21-19 Roaring Fork in a set destined to come down to the wire. It did just that as kills from McClung and Rowe gave the Cardinals a 25-24 lead before a long volley from Roaring Fork gave Grand Valley a thrilling 27-25 come-from-behind win in the first set. The second set was much of the same for both teams as the Cardinals held a slight 10-9 lead midway through the set behind a big combination block by Rigsby and Teter, a kill from McClung and a kill from Ruggles, while Roaring Fork received an ace from junior Lily Nichols and a block from Salinas. Following an ace from Ramos and a kill from Ruggles, the set was tied at 13-13 before the Cardinals pulled away late to win on two kills by Teter. In the third set a Roaring Fork player went down with an injury, which seemed to throw the Rams off their game, allowing the Cardinals to take advantage on offense and end the game quickly. With the win, Grand Valley improves to 10-5 (4-2 3A WSL) on the season. The Rams fall to 10-6 (5-3 3A WSL) on the season. The Cardinals will take on Olathe at 4 p.m. this Saturday, while the Rams will travel to Moffat County for a matchup with the Bulldogs at 1 p.m.